You may renew the license key you have without having to buy a new key. Your first notice that your license is going to expire should come in your email, sent to the address you used when you purchased the license. Your email reminder that your license will expire contains a link to the Easy Digital Downloads checkout page with cart contents and license key information pre-filled for a renewal, so that you can simply check out. An example email is below. If you don't have that email there are two other options available to you. One is to log into your Easy Digital Downloads account page. Below you can see an example of an expired license with a link to renew. That link goes to the Checkout page with your information all pre-filled for an easy process. 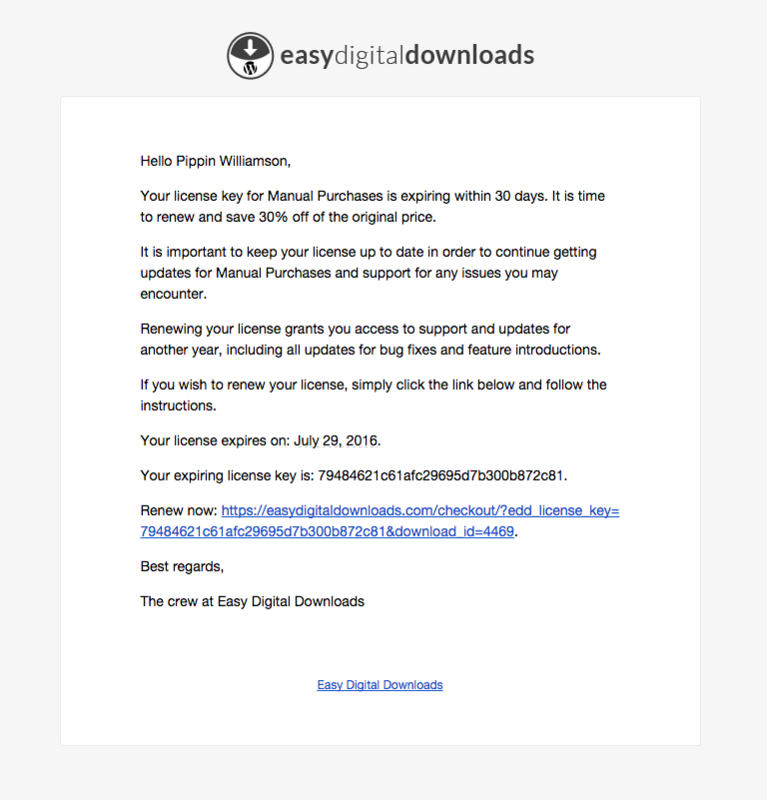 Additionally you can simply go to the Easy Digital Downloads Extensions page and add the product to your cart as if it were a new purchase. Then when you go to check out there's an option to enter your previous license key. Example below. All renewal discounts will be automatically applied and your key will be immediately valid after purchase. Once you click renew, you will be taken to the checkout screen where you can complete the license renewals.